This doesn't look at all like a regime that is going to survive for much longer - and I know there are people who now think Assad might make it through this because it has taken two years. 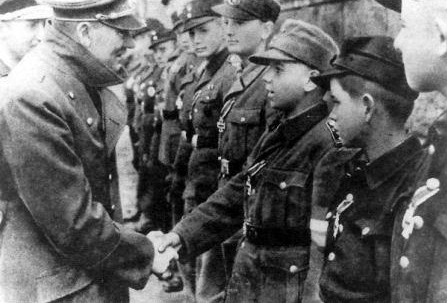 But this is irrelevant.In the last days of the Third Reich, the Nazis desperately tried to stave off defeat by recruiting child soldiers to fight in the streets of Germany's cities. No doubt regime enthusiasts will contrast the high profile presence of unveiled women fighting in Assad's army against the bearded men of the various rebel groups. But this action has less to do with equal opportunities and emulating America's recent decision to allow women into fighting roles and more to do with a desperate and undermanned (pun not intended) army trying to make up its numbers. I'm not much of an expert on military affairs, but the women in the video above are not fighters, and I doubt they will make much of a difference in the face of groups like Jabhat al Nusra. The precedent of such things is not promising for Assad either - when Gaddafi was murdered there was not a single member of his famous female bodyguards in sight. The only thing I felt when I saw that report from Russia Today was the same thing I felt the first time I saw the picture of Hitler's child soldiers, pity. Once more innocent people are being thrown into the furnace in a last ditch attempt to protect yet another "Father" of the nation. Hitlers Volkssturm hijacked a whole generation of young Germans and brought so much pain and suffering and furthermore a lot of guilt. These days I read of an father who survived as the only one of his big family an Assad led militia masaccre, and it reminds me a lot of a place I visited in Belarus. The german army killed an whole village in 1943( over 600 dead) for an ambush attack on their convey. Only one blacksmith and two children survived this atrocity. The blacksmith was in the forest during the massacre and came back only to see all people he knew and loved were killed. He buried all of them. Khatyn is now a memorial, a strong one. Its inmidst an forest, and for each house the Germans destroyed a Chimney stands up with an bell in the top. Every minute each bell silmutaniously rings and it doesnt leave anyone without an emotion.